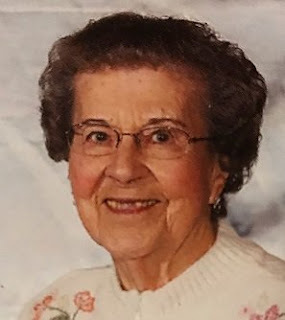 Audrey C. Roszman went home to be with her Lord on November 9, 2018. Born on April 4, 1925, she was the daughter Lewis and Helen (Johnson) Christie. She was married for 58 years to Jay M. Roszman who passed before her in 2006. Audrey was employed at Harrison Radiator as a secretary in the engineering department for over 20 years before retiring in 1985. She was a past member of The Rapids Bible Church. For the past 20 years she has attended Lockport Alliance Church and was affectionately known as the "Snack Lady". Her greatest joy came from being a generous and loving mother, grandmother, and great grandmother. Audrey is survived by her children, Douglas (Kathryn) Roszman, Jeffrey (Judith) Roszman, Cindy Roszman, Leisa (Robert) Shull; Grandmother of 12 and Great Grandmother of 10. Sister of Robert (late Sally) Christie, Sally (Thomas) Wittlinger, and the late David (Gloria) Christie, Gary (Joy) Christie, Norma (Floyd) Stahl. Audrey was an aunt to 13 nieces and nephews. Visitation hours on Sunday November 18th from 2-6pm at Prudden and Kandt Funeral Home, Lockport, and at Lockport Alliance Church Monday November 19th from 10-10:30 am, funeral service to follow at 10:30 am. In lieu of flowers, donations made to Lockport Alliance Church, Alzheimer’s Association, or Niagara Hospice would be appreciated by the family.